During past three years of my stay in Mumbai I always ask this question to myself everyday. Probably I am not the only one who do so but I am sure most of us so called Mumbaiakars do. There are more issues in this city than the population because every living being is having some issues of their own (now even birds got one). Big people talk of transforming Mumbai into Shanghai but the fact is that they had not even spared Mumbai to be in its original form. Let me try to put some candle light (power cut today in Mumbai also) on some major issues from my experience. Everyday morning I start from my house in Santacruz to go to my office in Prabhadevi with only one question in my mind, how much late I will be today (from the late coming limit of ten min. in our office). Traffic jam starts from my street itself then Bandra then Mahim and so on. Three years back I used to take twenty minutes less for the same journey. Thank God I am no Bill Gates or the losses will run in Millions of Dollars per day. While coming back from the office in the evening......please dont even ask because I generally loose track of time after one hour. And the credit goes to lot of entities (which I will write later) but majorly to our roads embedded with countless potholes. Moreover when MMRDA decides to do the overhauling of roads, they start with those which are in good condition keeping aside those roads where there is no road but only potholes. Once I was in a hurry to reach my home for my marriage anniversary and got stuck at Mahim in a horrible traffic jam. It took me not less then two hours to crawl to Bandra from Mahim. Suddenly my fellow car driver asked me, "Boss is this road going to Borivali", already in a bad mood I answered him, "Boss I dont know whether this road leads to hell or heaven but atleast not to Borivali today". This is the situation of roads in Mumbai. Now comes our over-smart Traffic Police or so called Mama's. I can bet that if they are present at some non-working signal, they will make sure that traffic is also non-moving, afterall there should be some synchronization between signal and traffic, its there theory or style of working. Towing vans are so quick and they will take your vehicle so fast that you always wonder, I can make a movie with them "Gone in 10 Seconds only". They can charge fine from you for hundred of reasons and you cannot do anything except paste a big grin on your face and try to push a 50 or 100 rupee note in their already heavy pockets and solve the matter (which still you are not sure what it is) with minimum amount possible. I sometime used to compare them with Yamraj and thakfully our Mumbai City got hundreds of them. After all this here comes BMC. I remember a quote given by some worried soul to DNA newspaper which they put on several hoardings in the city saying "What BMC is digging for: Oil, Gold or Fun". Very true, what BMC is digging for cannot be explained by me atleast. In last three months they had digged the street in front of my house three times at the same place. Anyway lets not mention my street's name or they will come and dig it again. Garbage removal system is so slow and smell coming out of it is so terrible that sometimes you feel that you are living in a dustbin. Unauthorized Slums, roadside hawkers, excess no. of autorickshaws and taxis..........the list of issues is so big that I am not able to mention and BMC is happily sleeping over them. Now comes another issue. Taxes. For each and every thing which comes to Mumbai City (except human beings) there is an additional tax called Octroi which is roughly 4.5% and after Value Added Tax and other charges it comes to approx 5.5%. That means we have to shell out this money from our pocket for each and everything. You will not believe one thing that Mumbai City is having two refineries, still cost of Petrol and Diesel is highest here in India. If oil companies dont have to even spend too much on transportation of refined fuel then why the hell cost of it is highest here. In one thing we had even left Shanghai behind, that is property rates. God only knows what will happen in future. And now comes the latest issue, power cuts. BEST had suggested all the multiplexes to stop screening shows after 6pm. What a suggestion, that means if somebody plans to go to a movie on some weekday, one thing is sure, either you take leave from the office or bunk school or college whatever is applicable to you. Dont put AC's below 26 degrees was another suggestion. Why dont we remove them, atleast you can say I am feeling hot because AC is not there, you will not feel that with AC also you are sweating. Why cant anybody here can think something creative to save electricity. You can promote CFL's instead of normal bulbs, advice consumers to change old heavy fans with new light ones, stop theft of electricity, educate consumers not to use lights during day time and many more but stop giving these foolish suggestions. Nice n strong a post!! Dont remind me of the traffic!! The traffic here in dubai is a lil more fucked up..They dont call it a jam...its slow moving traffic...I travel for over 3 hrs daily for the 30km distance to office..that too on the main highway that has 4-5 lanes. Good one, putting up points with a sarchasm! If I am not wrong, ur r Awasthi's papa n shilpa's hubby right?! U would better know me as Monil from IMS Scruz. hahahhahahha ... this was one of the funiest things i've read. i stopped doing everything just to read it ... gave me a good laugh esp. abt. the BMC...u write well.. keep it up ..
what keeps the mumbai spirit alive??? Dear Anonymous writer, all the issues mentioned here cannot be resolved by a common man and require somebody having political powers to resolve them. If it would have been in the hands of common man, things would have changed by now and nobody would have waited for advices such as yours. if you think this can be done, you take the first step and we will support you without conditions. If you feel about the city this way...why are you still staying here... go back to where to came from..
respect the place where you are...and then you will see d good side..
ae dil he muskil jeena yaha. 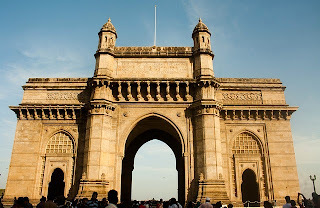 I like Mumbai and I think, it will be better with the traffic. I found a case study "Sustainable development: A better quality of life for Mumbai". They wrote, that they invest $2 billion in the transportation infrastructure. Great stuff! Nice piece of info there! Without traffic Mumbai will not be "Mumbaiii". There has to be some noise and shor in the city right?! And that's what makes Mumbai different! Leaving a everything beside, is there any city in India which looks as beautiful as Mumbai considering the night life in Mumbai? Do not forget to visualize "The Queens Necklace"